Finding the right words to express exactly how you feel can be a challenge, especially when it comes to love. Fortunately, Krispy Kreme is here to help you both express yourself and treat your significant other this Valentine’s Day with the debut of brand new donuts. 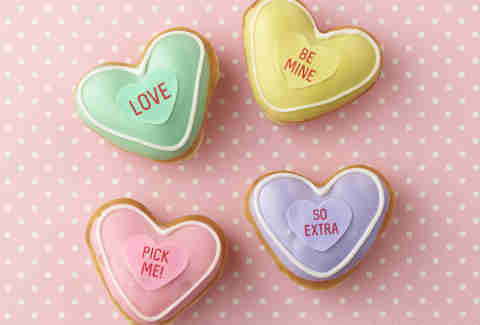 On Thursday, the sugary dough ring purveyor announced it’s introducing Conversation Donuts for the romantic occasion. The donuts are seemingly meant to help fill the heart-shaped void left by the classic Valentine’s Day candy, Sweethearts, which sadly won’t be produced this year after NECCO went out of business. Krispy Kreme’s new donuts will come in pastel yellow, pink, purple, and green, just like the chalky little candies you’ve come to know and love (OK, maybe not love). Each tasty treat features phrases like, “DM ME,” “ALL THE FEELS,” and “BE MINE.” Perhaps not the sweetest of messages, but cheeky will do. If you were worried about these donuts tasting like chalk, worry no more. As if the sugary icing wasn’t enough, Krispy Kreme has filled each donut with Cake Batter, Strawberries & Kreme, Raspberry filling, and Chocolate Kreme. That’s certainly better than vague nostalgia or traces of food coloring or whatever those little hearts are supposed to taste like. 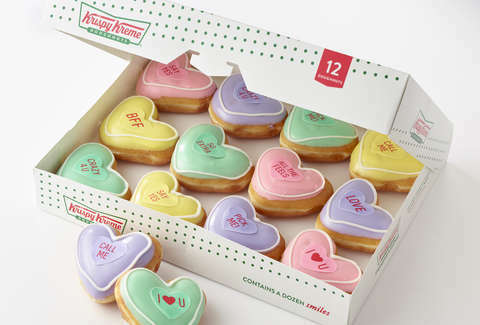 Conversation Donuts will be available at Krispy Kreme retailers across the United States from January 30 to Valentine’s Day. Rewards members can snag a free one on Wednesday, February 6 with any purchase, according to a press release, so it may behoove you to sign up now so you don’t miss out on free donuts ever again. Grab one conversation donut for the one you love, play the field and buy a dozen, or by all means sob-eat one of each while you spend the day alone. We won’t judge.